This is the finest model in the XA range - the original and best. It first appeared in 1978 at the Foto-Kina and came out on the market in the next May. It has a high-grade 6 element wide aperture lens (F-Zuiko 35mm F2.8), semi automatic aperture preferred shutter system (featuring aperture priority automation), and 85cm to infinity range finder. And of course the revolutionary capsule design. The camera is capable of taking extremely high quality photographs - certainly rivalling those from the majority of modern SLRs and many Leica and Contax models. A 35mm lens is probably the most usefull focal length for general use - if you need long focus lenses, you are going to have to put up with an SLR with all the weight and inconvenience they bring. The benefits of a camera that can sit in your pocket all day normally far outweigh the lack of long focus lenses and other gadgets. The rangefinder is what lifts this model above the crowd. If you have used Leicas or other rangefinder cameras you will know how quick and easy they are to focus. And with such a quiet shutter the camera is ideal for the sort of unobtrusive photography that captures people being people. And people are life and photography is about life and your passion for it in all its forms. You set the aperture with a positive click-stop lever on the front of the camera and then you can see the shutter speed in the viewfinder. The ultra-light shutter release and the ergonomics of the body let you take sharp pictures at slower shutter speeds than normal. There is a small lever on the base of the camera. This gives a +1.5EV exposure compensation for backlight, a battery check and a self-timer. The delay time of the self-timer is about 12 seconds after release of the shutter button. The red LED on the front panel blinks and an electronic sound beeps on and off. The full instruction book is here. The saga of the modern, pocket-sized, full-frame 35mm camera begins back in 1967 when the collapsible-lensed Rollei 35 first made its appearance. For a long time - until the Minox 35 EL was introduced in 1976, to be exact - the little Rollei, in its various German and Singaporian incarnations, ruled the roost unchallenged. Then, hot on the heels of the even smaller and lighter Minox folder, Ricoh brought out the slightly larger FF-1 - a folding, scale-focusing, auto-exposure 35 that´s still pocket-sized and closely parallels the plastic-bodied Minox´s features; and Vivitar debuted yet another pocketable, automatic - the pop-out-lensed 35EM. While Rollei 35´s and 35S´s continue rolling off the production line virtually unchanged, it´s no secret that these slightly bulkier, heavier, match-needle cameras have faced stiff competition from the current German and Japanese aperture-preferred automations, particularly the latest Minox 35GL. Now Olympus has joined the pocket 35mm fray with the new XA, which sits midway between the Minox and the Ricoh in size and weight but sports a host of incredible features not to be found in any other 35mm camera - pocketable or full-sized - that the world has ever seen. When you consider that the XA´s essentials were conceived by Olympus´ chief camera designer, Y. Maitani, who has given us such brilliantly unconventional machines as the half-frame Olympus Pens and full-frame OMs, this is hardly surprising. Closed Olympus XA gets high marks for neat, smooth, fun-to-fondle design. Note extended foot to allow camera operation on flat surface. Perhaps the most amazing thing about the Olympus XA is that, unlike the four other pocket 35´s already mentioned, it does not fold and its lens doesn´t collapse. And how, pray tell, can one achieve a pocketably slim full-frame 35mm camera that´s just over 1 ½ in. thick without bringing the lens forward for picture taking? By using optical ingenuity. The Olympus XA´s non-collapsible 35mm f/2.8 Zuiko lens uses an optical construction, that is, to put it mildly, unique. This six-element, five group optic is best described as a reversed retrofocus wide-angle lens which has been modified to shorten its overall length (approximately 31mm from front element to film plane) compared to its focal length in a manner resembling that of a true telephoto. In order to be able to cover 24 x 36mm format, large rear elements are necessary, and, for rigidity as well as shallow depth, internal focusing (by moving the third optical group back and forth) was selected. The optical problems that had to be solved as a result of this unorthodox approach were formidable - high-refractive-index glasses had to be used to control aberrations across the picture field, and optical elements had to be manufactured and aligned to very close tolerances. A lens like no other, the XA's "reversed retrofocus" is a 6-element, 5-group optic measuring about 31mm from front element to film plane. Focusing is internal, via moving third group. Achieving this extremely flat design necessitated high index crown rear element, special flint second element. Result is a super-compact, rigid camera body with rangefinder focusing. Is all this extra effort worth the trouble? Obviously part of the answer must wait until we get to the optical evaluation section of this report, but one thing is for certain, this design did permit (some optical engineers might say necessitate) the inclusion of a super-imposed-image rangefinder, a feature lacking on all the aforementioned pocketable 35´s. 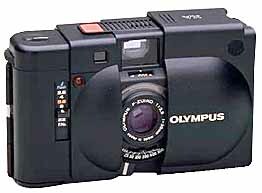 And taking advantage of the superior focusing accuracy that a rangefinder provides, the little Olympus focuses down to 2.8ft., a bit closer than the competition (except the Ricoh). As you might expect, the XA´s rangefinder is none too conventional either. With a base length of just over 5/8 in., it´s one of the shortest-based rangefinders ever built into a full-frame 35, and it focuses over its full range by moving a knurled tab below the lens and film-speed index back and forth almost exactly ½ in.! Focusing distances (in feet only on U.S. market models) are read out in a little cutout above the lens that´s visible from the top of the camera. Those who don´t like the focusing tab are free to use the knurled surface on the bottom edge of the plastic ring to which the tab is attached. Perhaps the best proof that the XA was conceived at the outset as a "pocket only" camera is its lack of separate case or lens cap. In their stead is a built-in, non-removable sliding plastic lens cover which Olympus refers to rather inelegantly as a "dust barrier". At any rate, its bulged-out appearance is as functional as it is distinctive, for it effectively protects the lens and front and rear viewfinder glasses without increasing the bulk of the camera, and its smooth contours make it easy to slip the camera in or out of even the tightest pockets. What about the rangefinder window, you ask? Worry not. As you begin to slide the cover closed, a tiny blind automatically covers that too, forming an almost hermetically sealed "case". Indeed the only accessory that is furnished (or need be) is a small fabric wrist strap that clips onto an exposed section of the camera back hinge (there´s a white arrow to remind you of this feature). To open the XA´s back, you close the cover fully, pull up on the rewind knob, and the back swings open to the right. Inside you´ll find a well finished plastic interior with a hefty, spring-loaded metal back-lock catch, and a multi-slotted take-up spool on the right, just below the knurled thumb-operated film-advance wheel (an "original" Olympus Pen feature also found on the Minox and Vivitar pocket 35´s). There´s a single sprocket wheel at the lower right-hand corner of the film aperture. Atop the XA are a small but legible self-zeroing film counter on the right, a squarish orange shutter release toward the middle, which incorporates a microswitch for a soft, vibrationless release, and almost in the middle, in a striated "finger grip" section just above the viewfinder is, of all things, a miniscule "speaker" that emits a not-too-loud but nevertheless piercing squeal under special circumstances. As long as we brought the subject up, let´s turn the camera over and see just when these little beeps and peeps might prove useful. Aside from the usual array of coin-operable battery compartment cover, rewind button, and slightly off-center standard tripod socket, the XA sports a small ridged handle adorned with a white index line. When pushed flush with the camera body, it´s at the (unmarked) "off" setting, but this cute little lever can also be set to point to any one of three dots, which is clearly labeled with its function. First there´s a backlight compensation setting marked "+1.5-back light," and extremely useful feature on an aperture-preferred auto-exposure camera lacking manual shutter-speed settings. Cameras without this feature can only be over-ridden by changing the ASA setting and, while the XA lacks a viewfinder indication that the exposure is being manually compensated, the location of the control makes it unlikely that a user will forget to cancel it - either inadvertently or on purpose. When you turn the lever to the second dot marked "Check," two things happen if the MX76 batteries are healthy - the camera emits a continuous, high-pitched tone, and a red light adjacent to the front-mounted aperture scale goes on. The final setting is marked "Self Timer." This provides a 12-sec. delay when you press the shutter release if the film has been wound and the lens cover is fully open. As you´ve probably guessed, the aforementioned red light flashes and the "speaker" beeps twice per second to let you know that the self-timer is being used. However, even more fascinating is the fact that in "self-timer" position, the selector lever extends about 3/8 in. in front of the camera, serving as a stabilizing foot when it´s placed on rough or sloping surfaces - pretty clever. O.K., now that we have the XA´s features pretty well in hand let´s take some pictures. With the sliding cover closed, pull up the rewind knob and load the camera in the conventional manner. So long as the cover is closed and the back is open, the shutter can be released and the shutter speed will be about 1/8 sec. to facilitate advancing the film until the leader is firmly secured to the take-up spool. Now snap the camera back shut, open the front cover, and set the film speed (ASA25-800) on the small, convenient-but-secure film-speed index directly below the lens. The only thing that remains (besides checking the battery power) before we can begin taking pictures is setting the vertical aperture scale to the right of the lens (f/2.8 to f/22). To do this, just position the small, ridged aperture-selector tab so that the white arrow on its top points to the desired f/stop. Incidentally, if you hand the camera to a tyro who can be bothered with neither apertures nor rangefinder focusing, simply set the aperture and the focusing scale to the orange settings and sufficient depth-of-field and a hand-holdable shutter speed will result in reasonably sharp shots in most cases. Metering system uses two CdS cells. Unmasked cell actually sets exposure; second cell behind diminishing series of fixed openings controls finder shutter speed needle setting. ASA control causes CdS cell behind aperture plate to move to various openings. Aperture control moves aperture plate in front of cell. Magnet on camera bottom controls timing of two-bladed metal leaf shutter. All right, the fateful moment has finally arrived and we are about to take pictures. Grab the lens cover by its three textured surfaces (there are round "dots" on the front and back overhang, and ridges on top) and slide it to the left as far as it will go. This is a commendably smooth operation provided you do it gently. Now bring the XA to eye-level and you´re greeted by a bright, clear viewing image of approximately 0.6X magnification with a slight magenta cast, and a contrasting square yellowish rangefinder patch in the center. At the edges of the finder, barely visible by eye-glass wearers, is a bright, white, Albada-type finder frame with hardly noticeable vertical parallax compensation marks (horizontal markings are not necessary since the finder sits directly above the lens). The frame is clearly visible under most lighting conditions, and most of it can be seen by eye-glass wearers. On the left-hand edge of the finder is a vertical shutter speed array covering camera-selected settings of 1 - 1/500sec., with a cross-hatched area above the "500" marking to warn of possible over-exposures. If the white needle points to a speed below, say, 1/30 sec. or in the warning area above 1/500 sec., you can grab the aperture tab and adjust it until, hopefully, a usable shutter-speed indication is obtained. This is easily accomplished without removing the camera from eye level. To take the picture, you just press very lightly on the large, flat electromagnetic shutter release and the two-bladed, inter-lens leaf shutter will fire to the accompaniment of a soft click. Like most leaf shutter cameras, the XA is as quiet as a mouse. Before we delve into the rangefinder´s characteristics, a few minor criticisms. Although we feel that the XA´s dust cover is as ingenious a "built-in case" as found on any pocketable picture-making machine, it does pass very close to the deeply curved front lens element middle, and if you don´t grab the textured surfaces when sliding the cover, it is possible to brush a careless finger over he lens, leaving a greasy streak in most cases. We did this several times and caution potential XA users to get into the habit of opening the camera precisely as illustrated in the instruction booklet. Insofar as the shutter button is concerned, we have no quarrel with its smoothness (although we would have liked it to have a bit more than "less than ¼ mm" of vertical travel), but it´s positioned so close to the top of the camera we couldn´t easily find it by feel, and it was too easy to inadvertently release the shutter while handling the open camera. We would have preferred that this large, flat, virtually "hair trigger" release has a taller surrounding "collar" to minimize misfiring and facilitate locating the release while shooting. Before we get back to the rangefinder, let´s attempt to settle the fascinating question of the best method of hand-holding the XA. If you hold it conventionally  like an old rangefinder Leica, for example, your left-handed grip will be marginal on the camera´s smooth exterior, and you will have to shift your forefinger from the focusing tab to the shutter release to take a picture. This is acceptable, but none too swift. For horizontal shooting, we found that the best way to hold the camera is to grip the left-hand side vertically, with your first three fingers draped over the top on the left thumb resting on the focusing tab. This frees your right hand to grip the camera with the right index finger poised over the shutter release and the right thumb resting on the film-advance wheel. This procedure provides a secure, two-hand grip, eliminates searching for the shutter button, and permits relatively rapid (1 frame per sec.) film advancing without removing the camera from the eye level. Okay, it´s time to see just how well the XA´s super-short-base rangefinder works in practice. Theoretically, it should provide sufficient accuracy to focus a 35mm f/2.8 lens with a 2.8 ft. minimum focusing distance. Furthermore, a semi-wide angle lens with these relatively modest specifications doesn´t require super-accurate focusing to begin with since its comparatively large depth-of-field will usually provide sufficiently sharp images despite any minor focusing discrepancies. Fortunately, XA owners have little reason to worry in any case  the camera´s rangefinder is easy to see even in dim light, and it has good separation between the stationary and moving images, and it´s aided by a very smooth operating focusing system. True, moving the focusing tab such a short distance to cover the entire focusing range does take some getting used to (especially if you´ve just been using an M-series Leica, for example) but the focusing patch is well defined and the rangefinder does "snap" satisfyingly into focus at the proper distance once you´ve used it for a while. Needless to say, focusing with any rangefinder is generally much nicer than estimating distances, particularly at wide apertures (in low light) and at shooting distances closer than 6 ft. In addition to its sophisticated features and what must be described as its distinctive and elegant appearance, perhaps the nicest thing about the XA is its overall handling. It´s scarcely larger and only ½ oz. heavier than the Minox 35GL, the smallest, lightest full frame 35 ever, and it´s equally self-contained. All controls are positioned for a secure grip and convenient operation and none have the feeling that they´ve been overminiaturized despite the difficult space requirements on so small a camera. Granted, it would have been nice to have apertures in the finder, for example, but some features understandably must be modified or sacrificed in constructing what must be described as the smallest camera possessing all the essential features demanded by serious photographers. Turning now to the XA´s tiny, integrated electronic flash, let´s begin with the good news. Unlike certain other flash units designed for pocketable cameras (notably the Rollei´s and the Minox´s), the Olympus A11 Electronic flash is really small  it adds less than 1 ½ in. to the XA´s length and not one iota to its height or depth. In other words, with the A11 in place, the XA will still fit comfortably in virtually any trouser or jacket pocket. Another agreeable feature is that it takes but one alkaline AA cell to power it, and it provides over 100 flashes ( a claimed 120 to be exact) with 5-10 sec. recycling, plus full exposure automation and manual "full power" control. To mount the A11 onto the XA, you simply orient its contacts and mounting screw in a knurled, coin-slotted mounting screw until it´s snug. 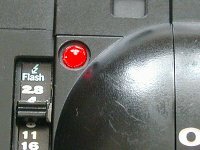 Once the flash is thus secured, you move a tiny tab on the right side of the flash head until "100," "400," or "FULL" appears in a little window above the flash sensor. Push the aperture tab up above the f/2.8 setting to the blue "blitz" marks and the camera will automatically be set to f/4 at 1/30 sec.  the "universal" flash settings. Also, as you move the aperture ring above f/2.8, you´ll hear a click, and the semi-transparent plastic readylight will pop up from the top of the flash unit. When either autoflash setting is used, a tiny sensor directly adjusts the output of the light automatically according to the distance. At the ASA400 setting, the autoflash range is 5 to 18 ft.; at ASA100 it´s 2.8 to 9 ft. At the "Full" (power) setting, you can make manual aperture settings in conjunction with the flash guide number (17 at ASA25; 72 at ASA400) and camera-to-subject distance but there are restrictions on this type of manual operation as we shall see. In general we were pleased with the A11 flash´s performance. However, our enthusiasm was tempered by what we regard as overly restricted film speed settings in the autoflash mode. Yes, we can live without shooting Kodachrome 25 with this rather low powered unit, but the lack of an ASA64 setting makes use of such popular U.S. slide films as Ektachrome 64 and Kodachrome 64 unduly difficult. One final minor point  the auto range diagram on the back of the A11 implies that ASA 100 and ASA 400 films can both be properly exposed at any distance between minimum and maximum listed, but, as the flash instruction booklet states, this is not possible  the minimum autoflash distance with ASA 400 films is 5 ft. At any rate, we like the clever method of shutting the flash off  just press in the pop-up readylight  but, after we´ve gotten used to quick recycling on our larger units, we found the A11´s 10-sec. recycling time (at a 9ft. shooting distance with ASA 100 films) a bit long. Finally, when the "manual" full power setting is used, the XA automatically sets the shutter speed based on the ambient lighting conditions and the f/stop chosen. So it is not generally possible to make manual flash exposure indoors, since the camera-selected shutter speed will usually be too slow, resulting in possible blurry ghost images. As the A11´s instruction booklet clearly states, the "FULL" setting is intended primarily for flash fill outdoors. Of course, these comments must be taken in context. This is, after all, one of the smallest and physically best integrated flash units we´ve ever seen, and if the addition of all our desired features would have doubled the unit´s size, then Olympus made a very wise decision to keep it just as it is. It is an extremely quiet package, testing at only 63 decibels. In the final analysis, the Olympus XA is a successful camera design because it is geared to the wants and needs of serious amateurs, who demand such features as rangefinder focusing and backlight compensation, yet is still automatic enough to provide sharp, well exposed photos in the hands of a tyro. Achieving this unprecedented degree of sophistication in so light, pocketable and superbly integrated a package is certainly a noteworthy achievement which carries forth the Olympus tradition of compactness combined with technical virtuosity. While other manufacturers may shake their heads at the XA´s optical complexities and wonder whether a 35mm f/2.8 lens really requires rangefinder focusing, it is our prediction that photographers  particularly those who already own 35mm SLR systems  will find its physical charms, and its picture taking capabilities irresistible. Optical bench analysis: On axis at full aperture, yellow flare was visible, along with very slight overcorrected spherical aberration. Flare was nearly gone by f/4. Off axis, yellow-green flare was evident at full aperture but greatly improved by f/5.6. Very slight lateral color and very slight astigmatism persisted to f/8. Field test slides: At full aperture, images were adequately sharp but ample flare could be seen in any bright objects, particularly those with highlights. However by f/5.6 the flare disappeared completely and images were impressively crisp and snappy. Pictures made with flash did show some slight edge falloff when the backgrounds were of an even tone, and the exposures generally were about ½ f/stop on the deeper, rich underexposure side which many people do prefer. Olympus XA 35mm rangefinder camera. Lens: non-interchangeable 35mm f/2.8 F. Zuiko (unnumbered), apertures to f/22, focusing to 2.8 ft., does not accept front-mounted accessories. Shutter: Electronically-controlled between-lens leaf with finder-indicated speeds 1-1/500 sec., auto-exposure range down to 10 sec., X sync. Viewing: combined optic range/viewfinder with Albada type bright frame finder, parallax-compensation marks. * specially mounted, compatible A11 Electronic Flash powered by single alkaline AA cell provides autoflash for ASA 100 and ASA 400 films plus manual mode for outdoor fill flash automatically sets camera to 1/30 sec. at f/4 at autoflash settings. Price:US$233 with A11 flash unit.